Have some interactive family fun at Passover. Teach the children. Perk up the most distracted guest at your Passover table. 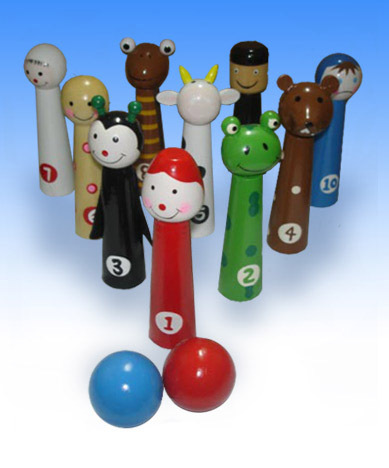 Punctuate the recitation of the 10 plagues by setting out on your table -one by one- the ten little bowling pins plagues in this set. Each of the ten pins symbolizes one of the plagues. Hail, Blood, Vermin, Boils, Locusts, Beasts, Darkness, Frogs, Diseased Cattle and the Death of the Firstborn - all are sensitively depicted so as not to frighten the youngest children. After the ceremony, move the Passover Ten Pins Bowling Game to the floor and have more family fun. Two sturdy wooden bowling balls are included. Pins and balls store neatly in a mesh bag. Handcrafted and handpainted.